Your Advanced Diver training begins with you coming into the shop and picking up student materials. Your book has many chapters, some of which you will use for this course, some of which you will use later when you do additional “specialty” training. The REQUIRED chapters are “deep” and “navigation”, and we can add three additional “adventure” dives to make up the five dives required for certification. We like the dry suit, peak performance buoyancy, and search and recovery adventure dives due to their obvious application to our environment. We can also add one more dive to the weekend and issue both advanced diver and dry suit specialty certifications. Another combination would be to add your Nitrox certification during the weekend to really maximize your training opportunity. Because you have already paid the rental fees, the additional charge for these certification packages is nominal. Once you have picked up your materials and completed the knowledge reviews at the end of each applicable chapter, we will get together for a knowledge review session, and fit your gear. If you have not trained with us before, we will need to get you in the pool for a “pre-assessment” (scuba review). This is to assure that your dive skills are up to par to continue with more advanced training and just serve as a refresher for those who have not dived in a while. The pre-assessment is not included in the price and will be an additional fee. A second pool session will introduce you to the dry suit in a confined water session where you will practice inflation, venting, and recovering from feet-first ascents. This session is required by standards and is very helpful in preparing you for the open water environment (if not already drysuit certified). 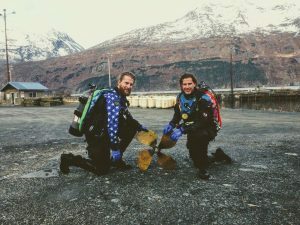 The open water dives will be conducted in Seward in the summer (May-October) and from the shore in Whittier in the winter (October-April). We will conduct five or six dives during a weekend. We dive a variety of sites depending on the season and the gear conditions, and we always formalize times and locations when we schedule classes. This class is $399, plus training materials and gear rental, based on what you already might own and what you need. Upon successful completion of the required dives, we will log our dives and brief you on the care of the gear prior to returning it. We will submit your application for certification when we return to the shop on Monday, and you can expect your certification card(s) within about a week. We appreciate your interest in improving your dive skills, thank you for trusting us to facilitate your goal, and we appreciate your business!